Mission Worship 2017 All recorded talks USB is a talk recorded at Mission Worship - 2017 on Multiple Teaching Themes available as USB Stick format. Mission Worship remains what it has always been; a conference for those at the coal face. Seminars are practical and pragmatic, with subjects ranging from PA techniques and instrument workshops to worship within urban communities and guidance on how to integrate new approaches into old church routines. 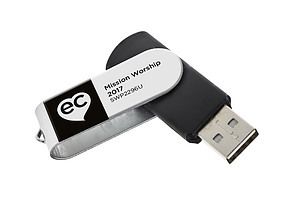 This USB stick contains all recorded teaching in MP3 (audio) format from Mission Worship 2017. Speakers include John Andrews, Mike Pilavachi, Lou Fellingham, Stuart Townend, Beth Croft and Noel Robinson. Sessions include When Worship Becomes Lifestyle Parts 1, 2 & 3, Stay Connected To The Prophetic, Leading the Next Generation, Bringing a multi-cultural approach to worship, Empowering Women in Leadership, and MultiMedia Uses in Worship. Be the first to review Mission Worship 2017 All recorded talks USB a talk from Mission Worship! Got a question? No problem! Just click here to ask us about Mission Worship 2017 All recorded talks USB a talk from Mission Worship.